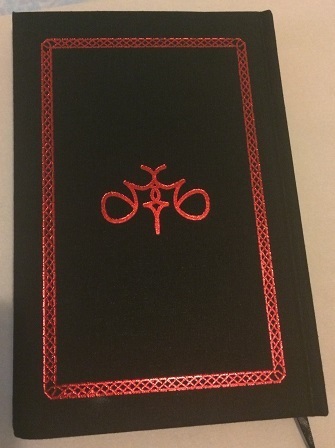 Just received my copy of “Black Magick of Ahriman”. This is the first physical book I’ve purchased from BALG and I’ve gotta admit I’m impressed. The printing is beautiful. 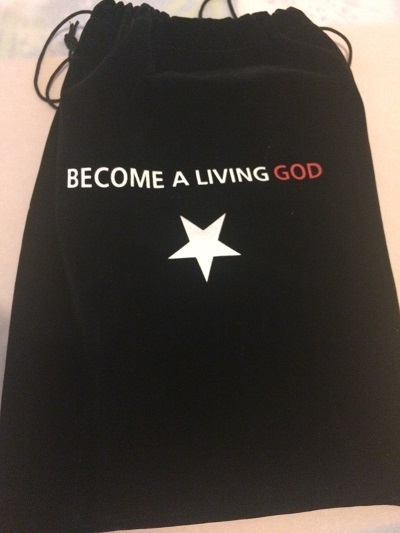 It’s a very high quality book with what looks like a black linen cover. It looks very durabe and I have no doubt it will last through years of use. That covers the physical book, but that’s not the really cool part. I was on the computer when my girlfriend in with it. I had my back turned to her. As soon as she walked in the door, I felt the book. As she handed me the package, I could feel the heat from it about a foot away from hands. This is not just an ordinary book. This is living gateway for a powerful magickal current. This book is a talisman. There are many occasions throughout the experience of the black magickian which bring one to the crossroads of decision. It is more often than not terrifying because the adept must make their decision by jumping head first into the abyss without hesitation. There is no chance to test the abysmal waters. What is most terrifying is that these are not passive waters which wait for you to dive into them! The abyss reaches out for you and drags you within itself to drown all that is human in order to give birth to something else. He’s not waxing poetic or merely stating a philosophical point, my friends. If you look at my experiences the past few days, you will see that the Abyss truly does reach out to people. This is going to be a very interesting journey. 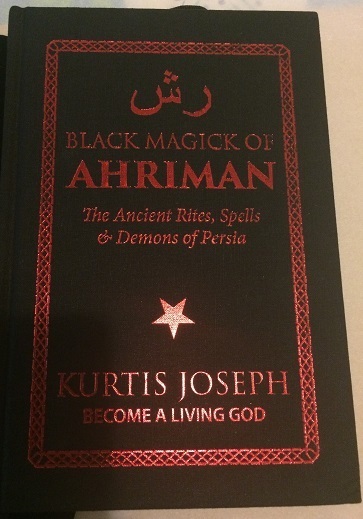 Thank you, @KurtisJoseph for the hard work you did … and the suffering you experienced … to give birth to this particular magickal current of Ahriman. Your work is appreciated, brother. Yes the book is indeed very talismanic and its power will grow in potency through application of the work. The Circle of Counter Creation and the Seals of Arezura are living gateways to these forces and so there was no need for direct “Consecration” of the book. I would suggest finding the Rite of Consecration within the book and consecrating the book itself with that method to consciously open gates to dark gnosis on our side of the veil. Will do. Thank you for all of your help the last few days. I really appreciate the advice on which physical exercises to perform. That one piece of advice has made a huge difference. In regard to the trials I experienced… yes it was very much a “catabolic” experience both physically, mentally and spiritually. Now that the work is released and I am starting on the next book I will be rebuilding. It may be a few weeks before I upload content as I am getting situated for the transition I am currently going through. I am waiting to get my copy. Dont when it will be delivered to India. Same kind of heat you can feel with Mark Smith’s books. Yeah, I’m sure that will take a while. It’s the worth the wait. I don’t really see myself as dark, dark guy so the stuff I was hearing about the book just didn’t resonate with me. But I can’t deny this is a powerful and active current. And I completely support the goal behind it. I just notice very well layed out the Black magic of Ahriman well done Kurtis on your Book tell me i would love to know how do i import pictures on the forum if using PlayStation 4 pro, i have purchased Haunted Antiques deadly possessions, a Haunted Cursed Doll Matilda the faceless wonder, a early 19th century Haunted painting, a haunted Ouija Board from Saleem edition there is a face of the devil in board, Dybbuk Satanic idol highly Haunted as well as my Dybbuk satanic rings Haunted as well, i just got a Possessed Haunted jar incredibly Haunted by Demon and poltergeist i used my Haunted Ouija board tonight 12:20 am using 2 black candles i got a instant contact with Satan he was very pleased with my progress i was told the Jug is very Haunted and there are 2 very nasty entitys, Demon and poltergeist they are not in jar they are attached to it, and was told the poltergeist and Demon Hate police and thieves and Catholics and Christians and don’t mind LHP Black Magicians. when i received the jar i put some of my blood inside jar to help with bonding with evil entitys and also i hung my Satan inverted Pentagram necklace over Haunted jug carefully i find it helps to bond with Haunted antiques straight away as soon as Haunted antique is delivered, i tell you what Kurtis since i own Haunted Deadly possession i feel a very dark presents in my home, i find its quite conferting, it help me when i practice the black arts, eventually i will purchase a very Haunted evil mirror in the future just have to wait for the right time i just wondering dark brother Kurtis if i eventually purchase the Black magic of Ahriman and have it in my home with my Haunted deadly possession, that will be interesting i just cant afford it right now, i will eventually if you want to there are plenty of Haunted antique Ebay, i enter Haunted Mirror for sale then i log into paranormal then it takes me to a page Ouija board underneith look on top there three i pick one on left paranormal there are 70 pages Haunted dolls, Ghost hunting equipment Haunted rings and more, check it out if own a computer or PlayStation 4, have a evil night, let the darkness forever shroud you hide you from your enemies. Grrr. I guess it takes longer to get to Canada. The men in robes came and delivered the book in a big ornate metal box. They where chanting Ah-ri-man over and over. Guided by instinct, since in their eyes, only a milky whiteness could be found. I thanked them and handed them each a gold coin and an oration of blessing. Ok so it was the Canada Post guy but it felt like a special delivery. You know @KurtisJoseph … I smelled the book. Couldn’t help it. Only managed the forward by Asenath Mason. This is going to take a serious deep dive. Abwahahahahahahaha! I am glad you guys are having fun with it. And yes… the dive is deeeeep. Would the depth of the Abyss be completely bottomless go on for eve, Kaiju size Demons. My copy arrived this morning! I am very interested in reading the section on vampirism. Like you, Kurtis, I have turned my nose up at vampirism in the past. But now I am interested in it after hearing your comments on it. If vampirism will strengthen my sorcery, then I’m all for it. Frater, if there’s ANYONE whose journal I want to hear, it’s yours, PLEASE share what you can, when you can, and if you despise me for this reply then that’s cool, you just do you, I have nailed my colours to the mast on here in all kinds of ways, and not everyone’s going to like that. Why would I despise you, my lovely lady? I will do my best to keep y’all posted on my progress. The first thing I’m going to do is read it from cover to cover. Same here. Cover to cover first, then integration within my practice. Chanting your very lucky, i don’t think Australian post would be chanting Ah-ri-man, if i purchase the book. Oh it was all in my head. The postman unceremoniously left the package between the screen door and the front door. Great book. I’m in about a hundred pages. I am super interested in this book, but I must know; is it material heavy to use? Like wand, robes, all that? Or would even just candles and incense work with it?